You Call, We Haul. Alberta is made up of 11 Judicial Districts with A Court of Queen’s Bench in each Judicial District for family law; civil law matters over $50,000.00 or matters of a very serious criminal law nature. In addition, the Alberta Court of Queen’s bench can hear Appeals from Masters Chambers and the Provincial Court of Alberta. In each Judicial District there are several local Provincial Courthouses that hear matters under $50,000.00 or less serious or dual/hybrid offences. Lastly, there are 2 Alberta Courts of Appeal in Edmonton and Calgary. On any given business day, the lawyers of Verhaeghe Law Office are in one or more of these courthouses helping clients just like you, with problems just like yours, whether it be Family Law, Divorce Law, Criminal Law, Civil Law or Appeal Law (criminal law & civil law). We do not judge and are simply here to help you in your time of need when formally retained. 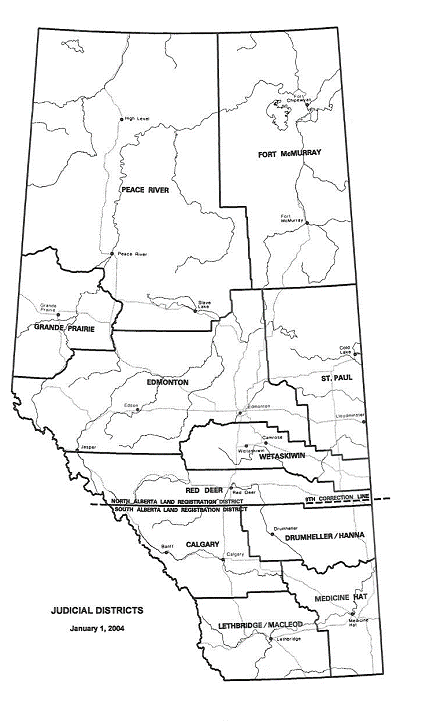 Below is a list of Local Provincial Courthouses and Judicial District Map of Alberta. This entry was posted in Courthouses, Richard's Blog by verhaeghelaw. Bookmark the permalink.